Earring Holder Stand Measures: 15 3/4 inches tall x 13 1/2 inches wide x 4 1/2 inches deep. The rectangular weighted steel base/accessory tray measures 13 1/2 inches x 4 1/2 inches and has quality felt pads to help protect your furniture. 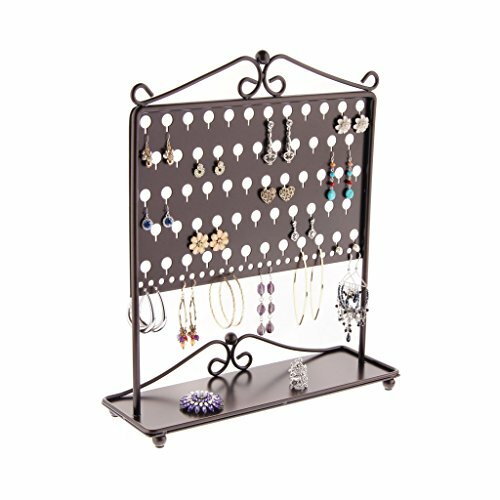 Earring Organizer Rack Capacity: Displays up to 43 pairs of earrings. Created for small to medium sized earrings, however longer earrings and hoop earrings can hang on the bottom row. How to use: Attach the post back (if there is one), leaving a small space on the post. Place the back through the keyhole and let it slide down into the slot. It's that easy! For hoops open the earring, feed post through any bottom row of holes and close. If there is no post back, just hang them.